The independent researchers of this study were fully aware that the levels of psychological disorders in the Muslim community is generally high, however the extent of its happening was unknown. Many persons are known to have suffered from depression and anxiety, but not many people feel comfortable speaking about their ordeal, or allowing others to know they have an issue. The topic concerned is one which is not spoken of openly in the Muslim community leaving many people to feel they cannot or should not speak about the ordeal which they have suffered. Sufferers often feel that developing something like depression is a stigma, which should be kept hidden and not spoken of. The study has revealed some shocking results, which will be highlighted in this report. The main aim of the report will be to use the information gained to place in some strategies to help those who suffered, those who silently suffering and to get Muslims more aware of the extent of mental health and illnesses in their community. An independent groups design was used to conduct this research, where a measurement of a number of variables we taken; including gender, ethnicity, age, nationality and religion. 290 participants were obtained from the general population via two methods: opportunity and snowball sampling. The surveys were distributed using electronic means, which the participants also forwarded on to others. The ages of the participants in this study ranged from 13-55 plus. 21 of the participants did not state their age. Of the remaining 269 of them, 80.67% were between the ages of 18-34. It was vital for the research to show how community members felt towards what was being done about the prevalence of mental health issues. An overwhelming 73.45% of the participants knew of one or more Muslim persons who had suffered from a psychological illness. When analysing the details of the types of illnesses suffered, depression was mentioned 150 times, anxiety occurred 63 times and schizophrenia 23 times. These key terms, of course, do not give a conclusive analysis of the types of illnesses which are prevalent in the Muslim community, but it gives a deep insight on to what our participants know of from those who have suffered. Many other disorders were mentioned a few times such as, suicide, bipolar, dementia, paranoia, OCD and more. Fig 1: The pie chart shows the percentage of participants who knew of one or more persons who had a mental illness. 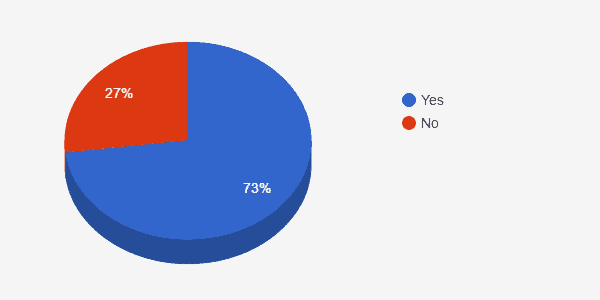 55.93% of males and 77.92% of females answered ‘yes’. 77.25% of UK residents knew of people who have suffered from a psychological disorder. 50.70% of the 213 respondents who said ‘yes’ knew of 1-2 people who has a mental illness, 26.29% claimed to know 3-4 people and 23.00% stated they knew 5 or more people. These results highlight that 49.30% of the 213 participants knew of more than three people who suffered a mental illness. This indicates that psychological disorders are an issue in the Muslim community, it is happening at a high rate but people are not being helped or speaking out. The research also found that 71.72% of the respondents felt that sufferers are made to keep quiet about the ordeal they have suffered. 84.83% of the participants felt that sufferers of psychological illnesses would benefit from receiving help off a professional who is Muslim. These professionals include advisors of mental health, doctors, Islamic professionals and more. Having a professional from a similar background will provide the sufferers with comfort to talk about their culture and religion openly, as their advisors have a deeper understanding of these factors. This perhaps, will enable people to speak more about these issues in greater depth. 93.10% of the respondents (and 92.22% of UK citizens) stated that they were not aware of any established organisations who aided Muslim sufferers of mental illnesses. Of the 13 people who stated they were aware of an established organisation to help Muslims suffering from psychological disorders, none were able to mention an organisation related to the topic. This highlights the importance of why an organisation such as Inspirited Minds is required. 93.79% of the participants felt that mental illnesses are not spoken of enough in the communities to help these victims. 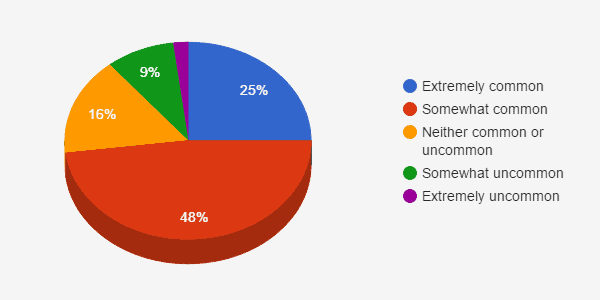 When the participants were asked about their opinions on the prevalence of mental health issues, every group had majority of people stating they felt it was somewhat common (which had a rating of 4 on a Likert scale of 1-5 (one being extremely uncommon and five being extremely common)). The results are shown below. Fig 2: The pie chart shows the percentage of the views held by the participants when asked to rate how common they psychological disorder were in the Muslim community. In the gender category, majority of participants in both genders rated the issue to be somewhat common. This was also found in participants in the UK and US (other countries had too less participants to make a fair judgement). Further, majority of the participants under the age of 35 also felt the issue was somewhat common as well as those between the ages of 35-54. These results indicate that the members of the Muslim community are aware of how common mental illnesses are, however there doesn’t seem to be enough knowledge of how to tackle these issues and aid those who have suffered. These are just some of what was said by the participants. Majority of people stated more support, help, counselling and family support is required (such words were repeated 177 times). A lot was also mentioned about the need of greater awareness and education in the community (words such as awareness, education, speak and talk were repeated 51 times). These comments would be taken into account in the establishment of the organisation, to aid sufferers of psychological disorders in the best way possible. A range of results were found from this study, which were more than what was anticipated. Mental health issues were known to be prevalent by the researchers, but the extent of its prevalence was not thought to be as extensive as that found in this current study. The 290 participants had highlighted that this problem is far greater than originally thought and a dire need of aid is required. The research will enable the organisation to be moulded into a form which will aid sufferers in a way which will benefit them and their families. The opinions of the participants will be taken on board to maximise the benefits as much as possible. The research does consist of a few methodological issues which will be discussed below. The current research had 98.97% of participants who were from the Muslim faith. This means that the results obtained are perhaps not applicable to people of other faith backgrounds. However, the aim of the organisation is to break the silence on the topic of mental health in the Muslim community and to abolish the topic from being regarded as taboo. The downfall of using a snowball and random technique to obtain participants is that there is no control on who can complete the surveys. Therefore, the current study does not reflect the opinions of majority of males, as 79.66% of the participants were female. Lastly, the research was also available for people to complete out of the UK. Majority of the analysis considered all participants; however this isn’t necessarily an issue. The main aim of the study was to obtain the viewpoints of Muslims, although the organisation will be UK based. The majority of the participants were from the UK (57.79%). The study had revealed much eye-opening data, which intensified the need of such an organisation. The results have shown that the Muslim community are not completely blinded to the issue of mental health and they do want something done about it. They also feel the subject needs to be tackled by Muslim professionals to help those suffering. The initial purpose of this study has been strengthened by the results obtained, allowing a stronger focus on tackling this taboo subject.